Fujifilm has announced the successor to the mirrorless X-T1, with the brand new X-T2. The new camera has been upgraded to a 24.3MP X-Trans CMOS III sensor, which was previously seen on the X-Pro 2, and a randomized pixel array to reduce aliasing and moiré without using an optical low-pass filter. While the Fujifilm X-T1 was primarily targeted at photographers with its autofocus system, large electronic viewfinder, and SLR-like body, the X-T2 is looking to take a chunk out of the videographer market by offering 4K/UHD video capabilities. The only downside is that the camera allows you to continuously record for only 10 minutes in 4K, but can be extended to 30 minutes with the optional Vertical Power Booster Grip. The camera captures 29.97, 25, 24, 23.98 fps at 100 Mbps, with a native sensitivity range of ISO 200 to 128000. The X-T2 also allows for HDMI output capable of 8-bit 4:2:2, as well as an F-Log gamma for workflows. The sample video only features what the camera does internally, and the blacks are a bit too crushed for my taste, so any serious filmmaker would probably want to consider capturing externally. The Japanese embraced 30 fps long ago, and I suspect the short film was captured at that frame rate so for those of you critiquing the video I would take that into account for someone looking for a more filmic look. What made the X-T1 popular was the autofocus system, which has been improved for the new generation. It features 325 individual AF points, and 49 of them covering the center phase detect, and 91 Zone focusing points, which is up from 49 in the previous model. 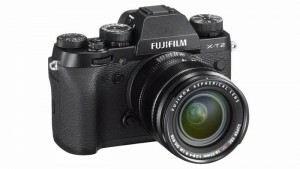 With the upgraded focusing features and censor, the Fujifilm X-T2 also utilizes the high-speed X-Processor Pro and improved algorithms that allows the camera to refocuse more frequently, and enabling predictive AF while also boosting start-up time, continuous shooting modes, and write speeds. The Fujifilm X-T2 is available for preorder at B&H for $1,599 (body only) [direct link] and $1,899 (which includes a 18-55mm lens) [direct link].